CT is accurate and reliable for measuring internal and external dimensions simultaneously, without destroying the part. The insight it provides through the additional fourth dimension of material density makes it the must-have tool for quality and production departments. 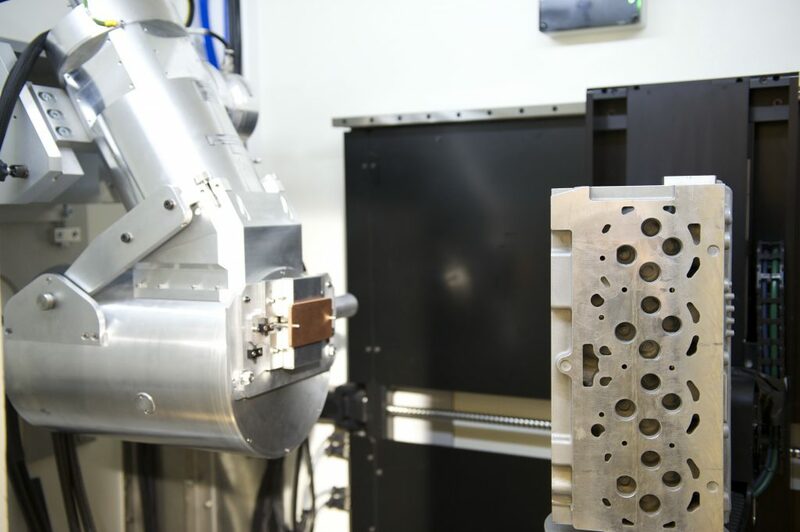 High voltage microfocus CT offers the same capabilities for measuring large parts and penetrating dense materials. It opens new CT applications for turbine blades, aluminium castings and many other sizable parts. CT offers a solution that is easy-to-use, fast and provides detailed insight, both in dimensional inspection, material structure and assembly. These insights result in faster problem solving and more effective decision making. Production engineering will also need less expensive prototypes and have little or no scrap. This saves both money and time in optimizing the manufacturing process. This all leads to higher productivity and shorter time to market. The X-ray tube is at the core of a CT system. Several different tube designs exist, but essentially an X-ray source consists of a tube or cylinder in which there is a filament (think light bulb) at one end, along with a high voltage cathode and anode, a magnetic lens and a metal target (normally Tungsten). The X-ray source is an open or closed tube source. Nikon Metrology provides in-house designed open tube sources, which allow you to replace the filament on a regular basis, typically having a much lower cost-of-ownership than closed tube sources, which have to be replaced when they fail, normally at great cost. The electron beam is focused using a magnetic lens onto a reflection target. A current is applied to the filament, which causes it to heat up and emit electrons. The electrons are repelled by the cathode and attracted to the anode by the high voltage field. This field accelerates the electrons up to 80% of the speed of light toward the end of the tube. Before they leave the tube, the electron beam is focused onto a target material, typically tungsten, using an electro-magnetic lens. The electrons slam into the target and the sudden deceleration of the electrons as they interact with the target pretty much just heat it up. Indeed that is what happens to over 99% of the energy in the electron beam; it goes into heating up the target. Less than 1% produces X-rays that are generated in a cone beam from the target. These X-rays emanate from the region where the electron beam hits the target. In general, the higher the voltage applied, the more power is in the beam, and consequently more power is transferred to the target. The more power on the target, the larger the X-ray spot size, and the more X-ray power produced. Find out more about Nikon’s unique in-house designed and built X-ray sources. Up until now it seems that CT offers us only advantages. But where are the pitfalls? One important limitation for many industrial (metal) objects is the density of the materials. Denser samples will attenuate the X-rays more, as can be seen on the table. Many system suppliers only offer microfocus sources up to 225kV, while more powerful sources in their offerings are minifocus. Minifocus sources produce more X-ray flux, which is great, but the spot size of these minifocus sources is orders of magnitude bigger compared to microfocus sources, heavily reducing the accuracy of the data. Don’t be mistaken: you need a microfocus source to acquire accurate and detailed CT data for most high-accuracy industrial CT applications, and a supplier’s spec sheet might not distinguish between the two types of sources. The standard 450 kV microfocus source features a spot size of 80 to 320 µm depending on the power, 3 to 8 times smaller than corresponding minifocus sources, providing industry leading performance for inspection of small high density parts or aluminium castings with unrivaled accuracy and resolution. Thanks to its open-tube design with user-replaceable filaments, the source has a virtually unlimited lifetime with a very low maintenance cost. For most demanding applications, the high-brilliance version utilizing a rotating target delivers 450 W continuous power, without any measurement time restriction, whilst maintaining a smaller spot size of 80 to 113 micron depending on the power, up to 10 times better than a minifocus source. Compared to the standard source, the high-brilliance version allows data to be collected faster, typically 3-5x, for a given spot size and power. Alternatively for a given power or measurement time, the available resolution will be higher so the data quality is improved. Find out more about Nikon’s high voltage microfocus XT H 450.